When Bill Terzi, co-owner of J.W. 's Public House on Glen Head Road, left his job in telecommunications after having worked in the industry for 25 years, he saw his opportunity to return to his roots - as a restaurateur. His parents had owned Lorraine Murphy's in Manhasset, a place that not only introduced him to the restaurant business, but also to his wife and J.W. 's co-owner, Mary, to whom he has been married for 26 years. "We just knew that this was our place," Ms. Terzi said recalling their decision to open in Glen Head and move into the location that formerly housed the Fishery Grill. 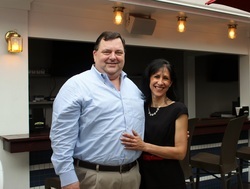 The name "J.W.," the couple explained comes from Mr. Terzi's given name - Joachim William, and "Public House" because it "is open to everyone just as our own house was when we always entertained there." In business for just over a year, the Terzi's describe the gastronomic offerings at J.W. 's as "upscale comfort food." With a menu that caters to many different tastes, the seafood offerings are the most extensive and include a raw bar, pei mussels, crab cakes and a variety of fish prepared "the way you like." Additionally there is a wide assortment of burgers, soups, and salads, as well as pork and chicken entrees and steaks. The most popular item is "Screamin Shrimp," Mr. Terzi said, "because it's delicious." The menu and specials vary according to the season. A gluten-free and children's menu are also available. The beverage offerings at J.W. 's are also extensive, with a wide assortment of bottled craft beers, including several IPAs, craft bourbons, and a diverse selection of wines. Throughout the summer on Thursdays and Saturdays, beginning at 7 pm, and occasionally during the rest of the year, J.W. 's hosts live music, with many local musicians scheduled to take the stage. This Thursday, stop by for a performance by Steve Silverman or see Nancy Siriani on Saturday night. Look for upcoming special nights such as "Taco Wednesdays, Guest Bartender Tuesdays, and Ladies night Thursdays, as well as special weeks including Southern week, Lobster Week, and Octoberfest. J.W. 's is open Tuesday through Sunday and begins serving at 4 pm. Catering services are provided during the day, and the outdoor patio is opened during the summer months. Happy hour is Tuesday through Friday from 4 to 7 pm. Join the Cash Mob visiting J.W. 's this Saturday, June 21. Click here for link to J.W. 's website and to its menu.